This is the first game in the WarioWare series. For other games in the series see the WarioWare category. 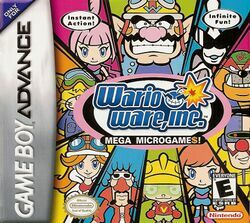 WarioWare Inc.: Mega Microgame$ (メイド イン ワリオ, Meido in Wario, Made in Wario in Japan and WarioWare, Inc.: Minigame Mania in the PAL regions) is a puzzle game developed and published by Nintendo for the Game Boy Advance and the first installment of the WarioWare series. It was released in Japan on March 21, 2003, in North America on May 21, 2003, and in Europe in May 23, 2003. It was later released to Nintendo 3DS ambassadors in 2011.